Wears out our bodies, and our clothes. From Bertold Brecht, "A Worker’s Speech to a Doctor." Poor people and health care alike are under siege in capitalist America. Public health scholar Vicente Navarro points out that 39 percent of terminally ill patients have difficulties paying medical expenses. In October, Arizona took direct action toward what the New York Times sees as "a death sentence for some low-income patients." The State cut Medicaid payments for bone-marrow, lung, heart, and liver transplants. International health practitioner Paul Farmer notes, "We are chronically short of resources…too often at the mercy of those with the power and money to decide the fates of hundreds of millions." He adds: "Ill health is more often than not a symptom of poverty and violence and inequality." Navarro details links between preventable deaths and capitalism: "Health care is the largest industry in the United States…a lot of money is made in the house of medicine. In no other sector of our society is the wealth of the few so clearly based on the suffering of the many." Repair efforts often focus on poverty alleviation and health care programs targeting the poor. That approach obscures the role of capitalism in incubating ill health. Increased social inequality is the tool of choice. Black males are 1.8 times more likely to die of heart disease than white men. But the risk to white workers is 2.4 times more than that faced by white lawyers. The life expectancy of African-Americans living in low income areas of Oakland, California is 70.5 years. Blacks living in well-to-do sections live 77.4 years. But rates for Oakland’s poor and well-off whites are 76.6 years and 82.3 years, respectively. With life expectancy categorized according to six levels of social class, the life expectancy of ÂprofessionalÂ class members at the top rose from 71.9 years in 1976 to 80 years in 2005. Life expectancy for the ÂunskilledÂ at the bottom rose from 66.5 to 73.8 years. Of 100,000 professional men aged 20 Â 64, only 17 died in 1993 from coronary artery disease. Of their unskilled counterparts, 82 died. The rates for stroke were 14 and 43 respectively; those for lung cancer, 81 and 235 respectively. British socialist Mike Haynes agrees: "The countries with the longest life expectancy are not the wealthiest but those with the smallest spread of income and the smallest proportion of the population in relative poverty." Widening social inequality reduces the average health status of all, he suggests. See full article at http://www.isj.org.uk/index.php4?id=559.Â The report, "Fair Society, Healthy Lives," issued last year, covers similar ground. Summarizing its conclusions, the U.K Guardian indicated, "Not only is life expectancy linked to social standing, but so is the time spent in good health: the average difference in "disability-free life expectancy" is now 17 years between those at the top and those at the bottom of the economic ladder." Lowered life expectancy relates to "inadequate diets, lack of exercise, smoking, poor pay, and job insecurity." See http://www.guardian.co.uk/society/2010/feb/10/equality-poverty-health-society. U. S. corporations and their political agents, Navarro says, are "attacking the standard of living of the working population in order to weaken and divide it, to lower its level of expectation." Dozens of states are threatening major Medicaid cuts. The Obama Administration’s debt-reduction commission would reduce Medicare funding by more than $400 billion. Accelerated cuts to so-called Disproportionate Share Hospitals, those caring for disproportionate numbers of socially vulnerable patients, are on the way. Economist James K. Galbraith recently traced the splintering of social cohesion. Manufacturing jobs peaked in 1979 and have declined since. Construction jobs fell from the early 1990’s on. What remains are low paying service jobs, often without benefits. The only remnants of an economic security that worked to extend U.S. life expectancy are Social Security and Medicare. With these programs under attack, Galbraith predicts "wealthier, healthier participants" will be aligning themselves with private protection plans, leaving millions adrift, living shorter lives. See http://motherjones.com/politics/2010/11/galbraith-social-security-middle-class?page=2. The plague of fear, jostling, and uncertainties is ready-made to further the capitalist scenario of class-based tensions leading to health catastrophe. While U.S. outlay for health care at $8,160 per capita is tops in the world, 50 million people are left uninsured with the result that, according to the American Journal of Public Health, 45,000 people die annually and needlessly. Capitalists have it their way. 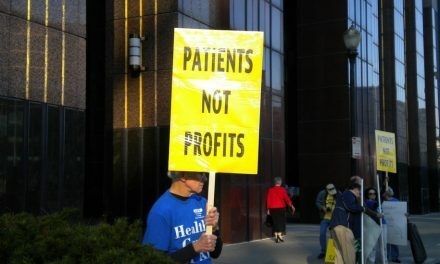 End of life care maximizes health industry profits. People at each others’ throats are sufficiently divided that threats of unified anti-capitalist mobilization are removed. Afraid of sickness, with care out of reach, people are afraid. Many end up isolated, removed from helping hands. Resentment and hopelessness parallel racial, gender-based, and anti-migrant animosities long exploited to promote disunity. Navarro looks for "universal programs [that] unite people." He objects to health reform projects targeting low – income people. They divide. In his remarkable 1993 book "Dangerous to your Health: Capitalism in Health Care" (Monthly Review Press), Navarro outlines how the universal health care project has evolved. Worker – based struggle builds confidence and unity, preparing the ground for change. Societies that achieved health care for all did so through worker-based political parties and strong labor movements. The United States lacks both, and as a consequence a people-centered national health program is still a distant dream. With colleagues, he demonstrated lowered infant mortality rates and long life expectancy prevailing in Sweden, Norway, Denmark, Finland, and Austria, countries with active labor movements and socialist governments in power. They instituted "stronger redistribution policies and inequality-reducing measures of a universalistic type." Next in line are countries dominated by Christian Democratic parties where mortality rates and economic equality data are less favorable. They are followed in turn on both accounts by nations ruled by liberal or conservative parties, Britain and the United States among them. Conclusions are in order. Poor public health outcome widens the class divide. And class divisions help weaken the public’s health. In that regard, high rates of preventable death and sickness are symptomatic of unrestrained capitalism. The fight for health care for all proceeds along two lines. One, even incremental reforms are applied universally. Two, the fight plays out within necessary struggle for socialist change.